Marketing Masala is a digital marketing and growth hacking agency helping global businesses with their digital marketing efforts. Our content predominantly revolves around digital marketing, growth hacking and social media domains with afocus on actionable strategies rather than mere facts and figures. Our aim is to assist marketers, growth hackers, SMB owners and startup founders in formulating effective and result oriented marketing strategies to give their businesses the edge in the digital ecosystem. If you have a track record of writing great content and would like to share your expertise with our audience of marketers and business owners, we’d love to hear from you. We accept only original, compelling and high-quality articles. We don’t republish articles that are published elsewhere. “How to” posts on digital marketing for small to medium businesses. Growth Hacking and digital marketing strategies for small/growing businesses. New things in the Digital Marketing sphere that will affect small to medium businesses. Social media marketing and SEO for small to medium businesses. Conversion rate optimisation strategies, examples and case studies. Posts should be of at least 1000 words. It should be unique and as detailed as possible. We won’t accept posts with spelling or grammar errors. If a post has those, it means you(the author) didn’t spend too much time on it. The inclusion of images, graphs, charts in your post will be highly appreciated.There is no restriction on their number. And Yes! we do accept Infographics as well. The credit/source must be provided for any external information that you have shared on your post. The author retains copyright, but Marketing Masala may reprint your piece, with full attribution, in Marketing Masala products, including marketing materials. We do not pay guest contributors for the guest post. We accept posts in either Google document or Word Document with the former being the preference. If your article meets editorial standards and aligns with our content strategy, we will respond to let you know your article will be published. That process may take up to 3 weeks. Marketing Masala team reserves the right to edit and adapt your guest blog content as we see fit, and update it in the future for accuracy and comprehensiveness. 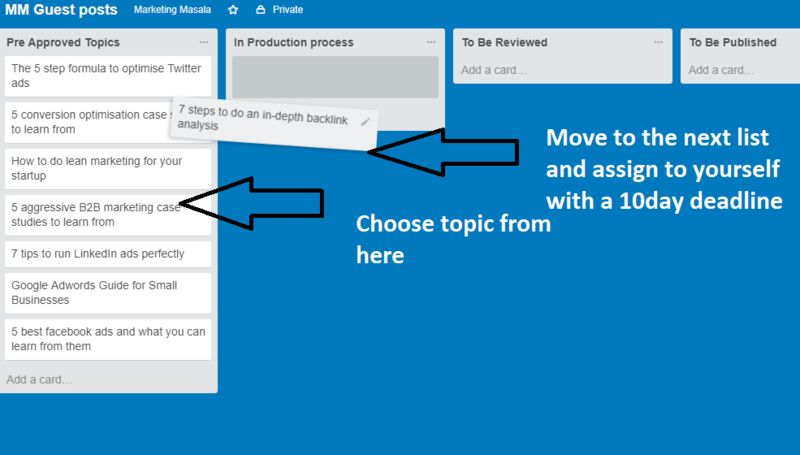 We use Trello - a project management tool to manage our guest post requests. In the MM Guest posts board, you will see five lists created and each item mentioned under a list is referred as a card. The “pre-approved topics” list consists of various topics. We request you to choose a topic, assign it to yourself by adding a member to that card and move the card from the current list to “in production process list” by dragging it. Once a topic has been chosen, put a deadline of 10 days to submit the guest post. After the guest post is completed, please attach the word document in the same card as an attachment.Move the card from the current list to the “to be reviewed” list. Once the article has been reviewed, the ones accepted will appear in the “to be published list” and declined posts will appear in the “rejected posts” list. Any post previously covered on our website before. Anything that’s inaccurate and offensive.